IronWolf 110 SATA SSD series will be available later in January. Data storage company Seagate has introduced a new series of SSD disks at CES 2019 aimed at enterprise users. With capacities ranging from 240GB to 3.84TB, the new IronWolf 110 SATA SSD series, which should be available later in January, come with DuraWrite technology. This technology ‘helps accelerate reads and writes, extend the life of the flash and provide up to 7000 TBW on the 3.84TB capacity drive,’ according to the company press release. The disks use 3D TLC and can offer sustained performance with between 560 and 535 MBps sequential read / writes. This depends on the capacity. Seagate expects the devices to be used for read-heavy NAS workloads, and it is targeting creative professionals, professional users, as well as enterprises, with the new offering. The disks also come with a 5-year limited warranty, and a 2-year data recovery support. Prices of flash memory devices are tanking, consequently bringing high-performance SSDs into more cost-effective waters. NAS devices come in different tiers and can be used as caches to improve the performance in real-life workloads. While SMBs are already aware of these capabilities and are taking advantage of them, home users and professionals alike have not yet tapped into this potential. 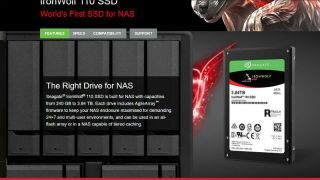 It seems as there is a market for SSDs that are designed mostly for the NAS market. It just needs to get the pricing right.